Most lodging that accepts pets have requirements and regulations. Typically, the property considers the size of your animal and if your pet is well mannered. The average allowed size is 25 pounds or less. However, there are many instances where a larger dog is welcomed with a little persuasion. Many have discounts which will always be all that’s listed on our hotel listings pages. Always call the hotel the day before to remind them you are coming with your cat or dog. This is done for two reasons: one, some hotels have special rooms set aside for pet travelers and two, some like to offer their furry guest pet treats and special gifts and this gives them a heads up to get it prepared. Make your reservation at Vacation Pet Friendly because here you will get special pre-negotiated rates and many of the hotels offer pet perks. 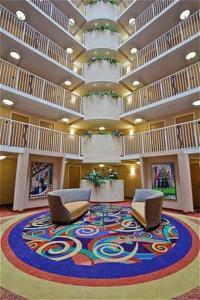 Reservations may be made online or by calling 1-877-375-1946. Alamo, AVIS, Budget Fox Bonaire, Hertz and National all allow pets in their cars. Thrifty allows service animals only. Reserve your car early, especially when traveling with a pet. Also, typically the cars are more expensive when rented at an airport counter, rather than approaching the counter with a reservation number in hand. The cleaning fee is where you can get hit the hardest, so make sure to keep your pet contained where he or she cannot dig his claws into the leather or cloth. Even if you use a carrier, you might want to consider purchasing an inexpensive fleece throw and putting it under it should water spill or there be any sharp edges that can harm the material. Make sure your pet’s nails are clipped. Wipe the seats so no fur is left. A simple swipe could save you a lot of money. 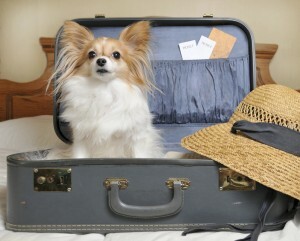 Here’s another article you may want to read on ways to make traveling with pets super easy. If your pet isn’t used to traveling in a car and this type of transportation is in your itinerary, start getting him used to it early. Take him on short trips at first and then lengthen them. You will be surprised how fast your pet will take to the car. Make sure to use a restrainer for his own safety. Plus, car rentals will require this. Whether your pet is allowed in the cabin or must travel in cargo usually depends on his size. If your pet is allowed in the cabin, he is considered a “carry on.” Some airlines limit the number of pets allowed on each flight to two. 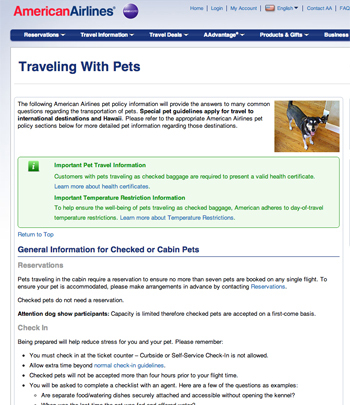 Make sure you know the pet policies and call before your flight to let them know you are traveling with your pet. Some airlines will not allow snub-nosed breeds to travel in the cargo hold including bulldogs, pugs and brachycephalic. The reason is as it poses a high health risk and can affect their respiratory system. Don’t give your pet solid food for six hours prior to your flight. However, giving him a moderate amount of water and a walking him before and after are advised. Visit your veterinarian. If your dog gets skittish in a car or you think he will be uneasy in a plane, ask your veterinarian if your pet can take a light calming medication. Most important, make sure your pet’s shots are up to date. Airlines require the certificate to have been issued no less than 10 days prior to departure. Some hotels require you have your records upon check in. Plus, often pet travelers have places in mind to visit that don’t accept pets, such as museums, find dining restaurants and theaters. You may want to find a nearby kennel or doggie daycare and you will need vaccination records for these facilities as well. Vacation Pet Friendly has many listings of kennels and doggie daycares in every U.S. city. Type in your destination into the search box on the homepage for Travel Guides.” Here you can find all the kennels, pet sitters and doggie daycares at your destination. Call them ahead and ask questions so you feel comfortable leaving your pet with them. If they don’t give you the answers you want to hear, move on to the next. There are plenty in each city. Read this article on how to find a good kennel. Visit Vacation Pet Friendly’s Travel Guide for whatever destination you are headed. Here you will find listings and maps of all the pet friendly beaches, pet friendly public parks and dog parks, events, activities, tours, expos, interesting sights, shops, veterinarians, kennels, doggie daycares and more. It’s worth taking a few moments to plan prior to your vacation rather than spending precious time doing this when you could be having fun. Make sure your pet’s tags have current information including your cell phone number. Portable pet bed or mat. This is easier if traveling by car. However, most three-star and up hotels provide beds and food/water bowls. Pets vaccination records where you can find them easily. Backpack just for your pet’s items. Baggies with pet food that your pet is familiar with until he gets accustomed to new food. Introduce him to new food gradually if the stores at your destination don’t carry your brand. Toy and familiar blanket – familiar objects will calm your pet when traveling to unknown places. Airline approved carrier – Each airlines that travels to and within the U.S. has its own set of acceptable carrier sizes. Nearly all require the pet is placed under the seat in front of you. Stroller: Many dogs are small enough where you can put them in strollers when you want to do some extensive sightseeing. Bicycle dog carrier – If you plan on doing any bicycling, there are carriers that attach to the handlebars of bikes. Clothing and protective gear – If you are traveling to a place where there are extreme temperatures, make sure your pet has protective clothing. Traveling Pet Supplies has a large selection. Walking shoes – These are good for areas where the surface has extreme temperatures such as in the snow or where the pavement is hot. 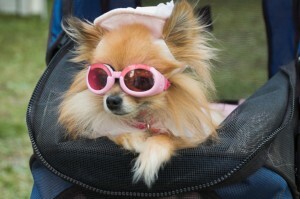 Sunglasses – There are sunglasses for dogs now with 100% UV protection. If your trip is a place that has intense sunlight, you may want to invest in a pair. They are only about $15 and will protect your pet’s eyes. Body and paw wipes – John Paul Pet wipes are great for traveling. Again, visit Traveling Pet Supplies for the lowest prices on these types of product. Waste bags – Typically airports and hotels have areas where you can take your dog. Make sure to be prepared. Flight reservations – Visit this page to see current pet policies of all airlines flying to and within the U.S.
Visit Vacation Pet Friendly’s Travel Guide for your destination to find pet friendly restaurants, parks, activities and more. Basically everything from where to stay to where to play. Visit your veterinarian and place vaccination records in your purse or other carry on. For overseas travel (including Hawaii) inquire about any special health requirements such as quarantine. Here is a blog on taking your pet to Hawaii. It’s a must read! Please Contact Us if you have any tips of your own you would like to share. We are a community of pet lovers that love to travel so all suggestions are welcome.